Amaircare 7500 AirWash BiHEPA employs Two sets of Amaircare HEPA and Carbon filters and is powered by Two motor/fan units. It renders the Amaircare 7500 AirWash BiHEPA twice the air filtration capacity and power of Amaircare AirWash Whisper air purifiers and makes the Amaircare 7500 BiHEPA a perfect choice for a whole house or office air purification up to 3750 sq. ft.
Amaircare 7500 AirWash BiHEPA whole house air purifier installs next to the house's HVAC system air handler (furnace) in a basement, a utility room or an attic and connects to the return section of the air duct work system. 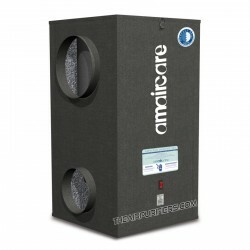 The Amaircare 7500 BiHEPA whole house air purifier draws the portion of a polluted air (about 30%) from a return air duct, pushes it through the high-efficiency dual air filtration system of the unit and returns the purified air back into the air duct for a further distribution throughout the entire house or office space using the existing air duct system. The Amaircare 7500 BiHEPA whole house air purifier can also be used as the air handler to run fully independently (the air duct network system is required). 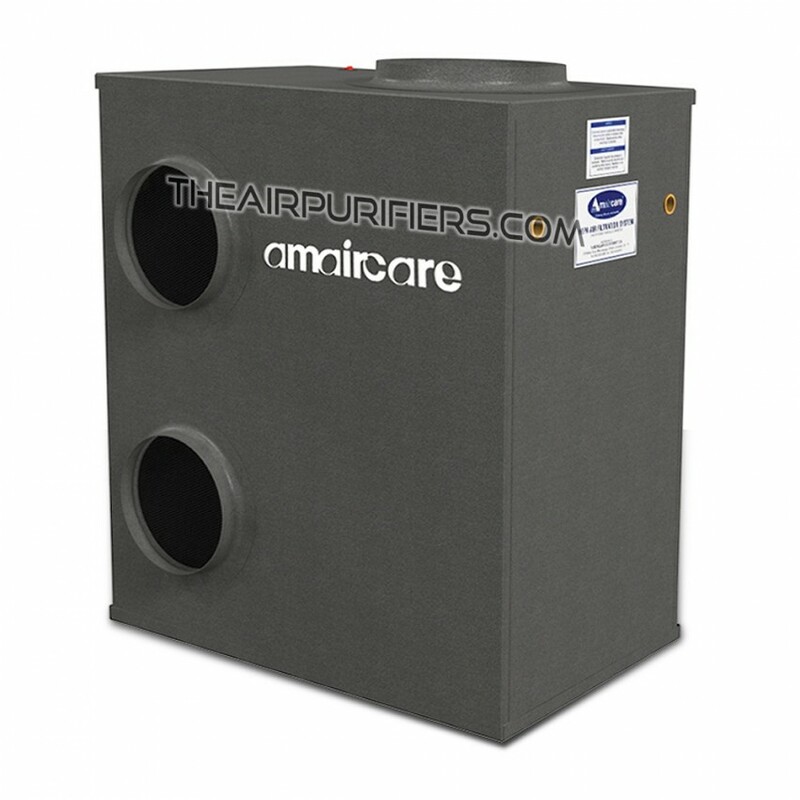 Amaircare 7500 AirWash BiHEPA Left & Right outflow knock-outs (2 on each side) ensure a perfect fit installation for any space or air handler configuration. Amaircare 7500 AirWash BiHEPA provides the air purification in every room of the entire house or office area. Amaircare 7500 AirWash BiHEPA uses the existing air duct network to deliver a continuous supply of clean air to every room in the house. Amaircare 7500 AirWash BiHEPA installs in a basement, in a utility room or in the - out of way and out of sight. Independently powered the Amaircare 7500 AirWash BiHEPA keeps circulating the air regardless whether the HVAC fan is ON or OFF. Amaircare 7500 AirWash BiHEPA promotes more even air temperature and humidity levels throughout the whole house. Amaircare 7500 AirWash BiHEPA does not impact the HVAC performance and does not affect the HVAC warranty. Amaircare 7500 AirWash BiHEPA - When to Use? 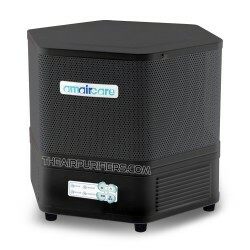 With the standard configuration of air filtration system the Amaircare 7500 BiHEPA air purifier is very effective in purifying the air in the whole house or office space from all airborne contaminants (allergens, dust, pollen, etc. ), most regular chemicals, cigarette smoke and household odors. The available optional VOC canister with either 100% carbon or specialty 'Formldezorb' adsorbent can be used instead to boost the ability of the air purifier in removal of VOCs, heavy chemicals, cigarette smoke, formaldehyde, pesticides and other harmful chemical substances in the air. 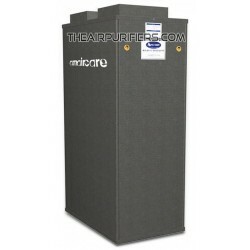 Amaircare 7500 AirWash BiHEPA air purifier employs a Dual High-efficiency 3-Stage air filtration system. It consists of Two Full Sets of filters. 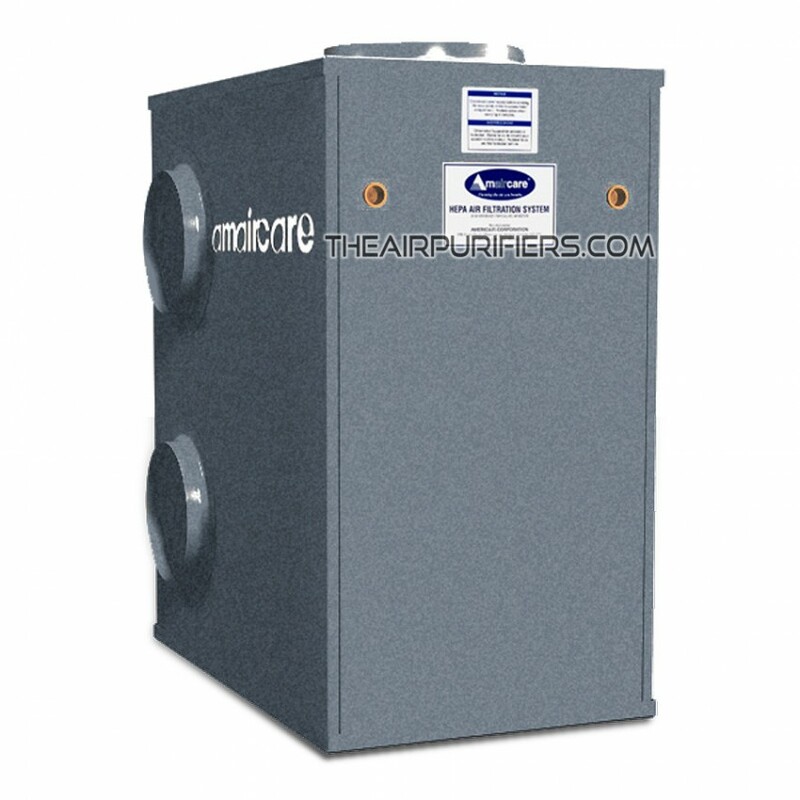 The foam pre-filter is the first stage of Amaircare 7500 air filtration system. 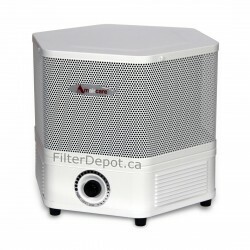 The pre-filter surrounds the True HEPA filter. It captures large dust and dirt particles, protects fine True HEPA filter from fast contamination and extends its lifetime. 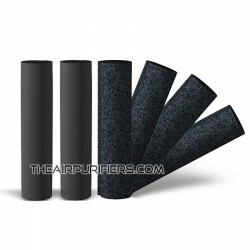 The foam pre-filter is a washable, re-usable filter and is good for up to 12 months. 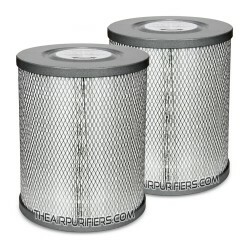 One replacement foam pre-filter is included with either Amaircare 7500 Standard, Plus or Ultra Annual Filter kit. 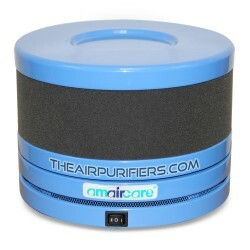 Amaircare 7500 AirWash BiHEPA air purifier requires two pre-filters - one for each set of filters. 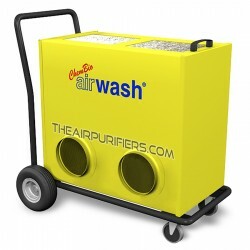 The Amaircare 7500 AirWash BiHEPA installed air purifier employs two oversize 16-inch tall True HEPA filters with the enormous 200 sq. ft. (100 sq. ft. x 2) total effective surface of certified True HEPA filter media. This renders the immense filtration capacity and makes Amaircare 7500 AirWash BiHEPA a True powerhouse for effective large-scale removal of all microscopic allergens, cigarette smoke and dust. 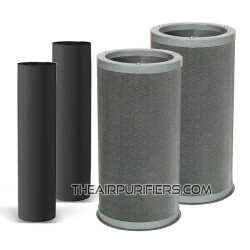 The Easy-Twist HEPA filter design features the Amaircare's 'Perfect Seal' filter technology. 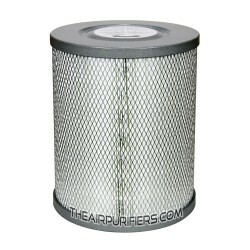 It ensures a perfect seal of the filter chamber and guarantees that no polluted air by-passes the filters. The 7500 BiHEPA has a removable filter access panel. It makes the filter changing procedure in Amaircare 7500 AirWash BiHEPA fast and easy. ULTRA VOC Canister with 29 lbs. of 100% activated carbon. 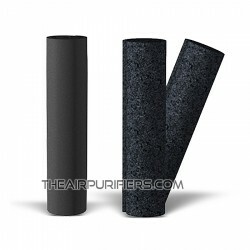 The standard carbon blanket filter is a 1/2 inch thick non-woven polyester based filter imbued 200% with Activated Carbon. 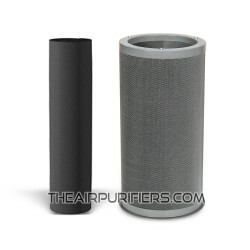 It effectively removes most regular household chemicals and odors, including cigarette smoke. The optional VOC Canister has a metal construction and is filled with 6 lbs (2.72 kg) of 100% granulated activated carbon. The VOC canister helps remove hazardous VOCs and other dangerous chemical substances released by consumer electronics, household cleansers, paints, carpet, wallpaper, new furniture, cigarette smoke, etc. The VOC canister's lifetime: up to 12 months. The VOC canister filled with 6 lbs. (2.72 kg.) of Amaircare's proprietary 'Formaldezorb' adsorbent helps significantly improve the ability of the Amaircare 7500 AirWash BiHEPA in removal of Formaldehyde, VOCs, pesticides, ammonia and other specific chemical substances. A single VOC 'Formaldezorb' canister is included with each Amaircare 7500 BiHEPA Plus Annual Filter Kit with 'Formaldezorb'. 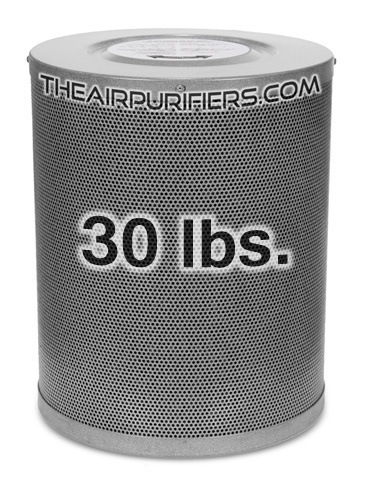 The ULTRA VOC canister offers a massive amount (30 lbs. / 13.62 kg) of 100% activated granulated carbon adsorbent. Such a massive amount of adsorbent combined with an extended dwelling time in 2.5-inch deep carbon bed renders the unparalleled adsorption capacity in removal of most hazardous VOCs, dangerous chemical substances, heavy cigarette smoke and most other chemicals in high concentrations. 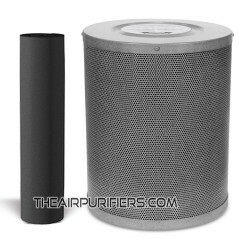 The ULTRA VOC canister can only be installed instead of Easy Twist True HEPA filter - one or both. Please note, replacing both True HEPA filters in Amaircare 7500 air purifier with Ultra VOC canisters helps significantly boost the adsorption capacity for heavy chemicals and strong odors. However, the absence of True HEPA filters also makes the unit inefficient in trapping of microscopic allergens and dust. The Amaircare 7500 AirWash BiHEPA is equipped with Two high-efficiency, powerful, yet Energy efficient thermally protected motor/fan units - one for each set of filters. The single-piece Motor/Fan power unit is a factory balanced to ensure a vibration and noisy-free quiet operation. The motor is run tested for 50,000 hours = 2083 days - 5.7 years of continuous operation. 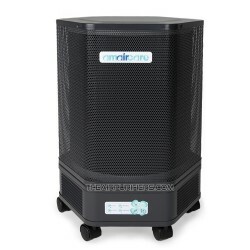 The Amaircare 7500 AirWash BiHEPA air purifier is equipped with a variable speed control. 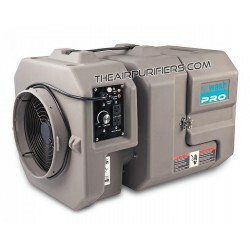 The total air flow rating ranges from 500 CFM to 1000 CFM (with all filters installed). 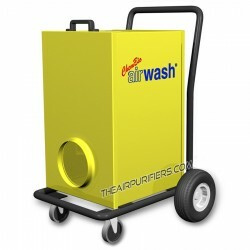 Amaircare 7500 AirWash BiHEPA is powered by two energy efficient motors for 120V / 60Hz. The unit can be equipped with 220-240V / 50Hz motors and power cord with multiple type plugs. The power consumption - 320 Watts on High setting. Amaircare 7500 AirWash BiHEPA uses the 12 foot IEC Detachable Power Cord w/ 3 Prong Grounded Plug. 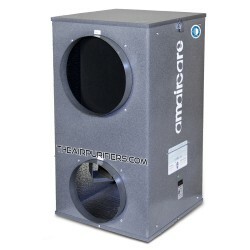 Amaircare 7500 AirWash BiHEPA air purifier features durable, impact resistant the all steel housing design of rectangular shape made of 18 gauge cold rolled steel. The durable baked on powder coating produces No toxic off gassing and is available in a single Meteorite color. 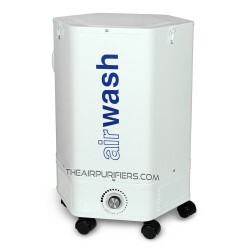 Amaircare 7500 AirWash BiHEPA air purifier is equipped with a single 14' diameter intake collar and two knock-out 8' diameter outlet collars on each side. The Left & Right Outflow knock-outs ensure a perfect fit installation for any space or air handler configuration and for easy connection to the existing air duct using the standard round rigid or flexible ventilation hoses. 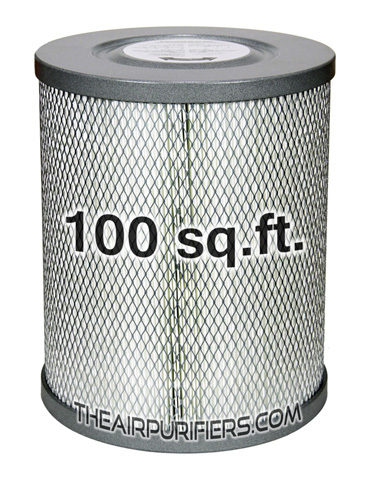 Single 14-inch diameter Air intake collared (top of the unit) with Metal Mesh pre-filter. Two 8-inch diameter Knock-out Air outlets collared on either side of the unit. Two Front and Rear removable panels with handles allow for easy access to the filters and motor compartments. Fully Assembled (the VOC canisters can be shipped in separate boxes to avoid damage in transit). With two full sets of Filters (per model specification). Requires DIY of professional installation with connection to the existing air duct of air the handler (HVAC). Plugs into a regular electric plug using the heavy duty IEC detachable power cord with three-prong plug with ground pin. The Installation Kit containing the flexible hoses and collar clamps is available on demand. Amaircare 7500 AirWash BiHEPA whole house air purifier ships by Ground freight delivery services in Canada and the Continental USA. There are no additional charges or extra fees related to the border crossing shipments (if involved) to all US and Canadian customers. Inspect the entire content of the shipment for possible damages in transit or missing items upon arrival. If the problem is found, it has to be reported to the driver of the courier company, the detailed description of the damage has to be written in the Delivery Receipt and reported to our company's Customer Service without a delay.